Superb at every turn, dining on Crystal Esprit blended Continental-inspired dishes with tropical-influenced flavors. An example of the range of dishes includes, for instance, a memorable smoked Wagyu beef starter as well as a simple, but delightful mango-oriented twist to an apple crumble dessert. 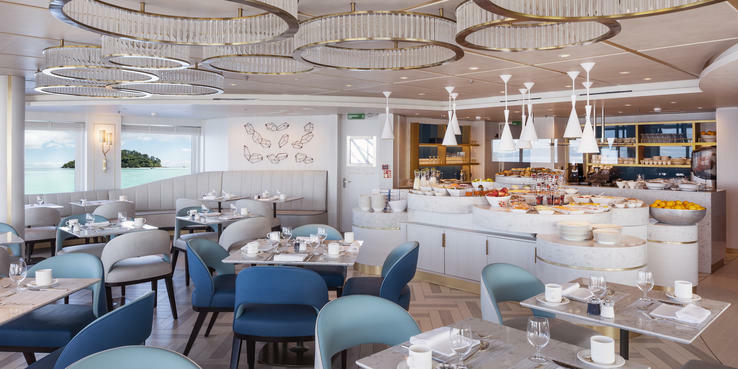 For a ship of just 62 passengers, it's a wonderful surprise to find four different dining options available to passengers throughout the day. Nearly all drinks are included in your cruise fare, but connoisseurs can also order off a special wine list, for a charge, if desired. Pantry (Deck 3): This lovely spot, right off the main lobby, is open 24/7, and features a coffee-making machine for cappuccino and the like, cold sandwiches and pastries, and beverages, such as sodas, chilled water, beer and wine. Patio (Deck 4): The indoor/outdoor Patio is the spot for breakfast each day and features made-to-order egg dishes, waffles and pancakes from a menu that changes daily. The daily fare is laid out beautifully on marble countertops and includes house-baked pastries, fresh fruit, muesli, yogurt, and cold meats and cheeses. Smoothies and even a quinoa salad are on hand for healthy eaters. An omelet station, with hot plates of bacon, sausage, potatoes, baked beans and oatmeal are available as well. Beverages include all manner of coffees and teas but also freshly squeezed orange juice, along with other fruit juices. Lunch also centers on the Patio and is equally casual with a mix of made-to-order dishes and pre-prepared fare. There is always an array of cold appetizers. A daily pasta station offers dishes from a traditional bolognaise to shrimp linguini. Salads, which are appreciated by a largely healthy-minded passenger base, include a nice variety of meal-worthy options; a favorite was the Thai beef salad with steak and lime chili dressing. For those wanting heartier lunches, there is a "dish of the day" (like lamb shish kebab or fish and chips). A selection of mini-desserts and a carefully curated cheese tray round out the options. Wine and beer are liberally poured. Yacht Club Restaurant (Deck 4): At night, the Yacht Club Restaurant, one of the few open-kitchen eateries we've seen at sea, is large enough to seat all passengers at once should they all descend simultaneously. That rarely happens, but regardless, the restaurant, with its numerous two-tops and handful of larger tables, is convivial and elegant. If passengers dressed casually for active endeavors during the day, they dressed up for the Yacht Club in resort finery. The menu each night offers amazing choice and is always of the highest quality. Each evening there is a special four-course menu, with a starter, soup, fish or meat entree and a dessert. One night's menu is particularly memorable, beginning with the aforementioned charred Wagyu beef crudo with mashed potatoes and horseradish cream (surely a meal in itself), brought to the table wafting in hickory-scented smoke. It was followed by tomato gazpacho, the choice of either broiled sea bass or pork (or both if that took your fancy) and a lemon souffle for dessert. If the set menu doesn't suit, there are supplementary dining choices. In this case, passengers can opt for the regular menu -- which features five courses. This also changes daily. Appetizers could be a forest mushroom tart with arugula salad, char-grilled octopus or lobster samosa with curry aioli (marvelous). The soup/salad course offers French onion soup, consomme with poached quail egg and lime-infused sweet potato, and the salads range from a simple mesclun lettuce with vinaigrette to a vegetable nicoise. There is always a pasta -- and often the pastas were the best we'd ever had, anywhere -- particularly a simple farfalle with tomato cream or a pappardelle with short rib ragout. Mains are also standouts, particularly the shrimp curry, braised drunken duck and Dover sole. And here's the thing: You don't have to take one menu or the other. You can mix and match as you please, or have a pasta starter or entree, or start with dessert and cheese and finish with prosciutto de Parma or order something off-menu entirely (as long as the ingredients were on hand). It's the most flexible cruise restaurant we've ever experienced -- and the extreme quality, considering the size of the yacht and its correspondingly small galley, is miraculous. Sunset Grill (Deck 5): In the afternoon, from noon until 5 p.m., the Sunset Grill, adjacent to the top-deck Sunset Bar, is a favorite haunt -- both for its down-home grill fare and its expansive opening hours. Sandwiches, like beef and salmon burgers, and Black Angus minute steaks are accompanied by freshly made French fries (the sweet potato fries are particularly popular). The pizza Margherita is also a good bet, but by far, the Chinois chicken salad is the dish everyone raves about. Room service: If all of the above does not quite suit, room service is available around the clock. During non-restaurant hours, you can order a handful of sandwiches, cheeses, salads and sweets. During operating hours, whether it's the Patio for breakfast or lunch, the Sunset Grill in the afternoon or the Yacht Club for dinner, passengers can order from those menus as well.